I was looking back through my old posts for some reason and I realized that I have never posted any quilting things here other than a small kit that came on a UK stitching magazine. There isn't really much of a "story" here, but I figured I should post a little about how I got in to quilting since I've written so much about how I got in to cross stitch and embroidery. I think I've always liked quilts, but I actually got interested in making them in 1994-95 while I was working at Hobby Lobby. I was working in fabrics and needlework, so of course I occasionally got quilters at the counter. They were easy to spot, they would come up with 10 bolts of fabric and only want a quarter or a half a yard from each (finding pre-cut fat quarters at craft stores wasn't as common back then). And we had to stock notions, books, etc. and during that process I saw a book from the "American School of Needlework" collection called Decorator Quilts in a Hurry that had a really cool celestial-themed fabric and design on the cover quilt. So I bought that book to make the quilt on the cover (which, to this dates, I still haven't done). Right about this time, the first of my friends from college to have kids found out they were pregnant with twin girls (who graduated from high school yesterday - I cannot accept that!) so I figured that making them some baby quilts would be a good way to get into quilting. I picked up another book called Stitch it, Snip it & Flip it that had a neat quick trick for making, among other patterns, star shapes. So, the first two quilts I ended up making were the two for them. I don't have the scans handy, but I'll eventually post some pictures. I also bought yet another ASN book Quilting for People Who Don't Have Time to Quilt (I ended up with a bunch of those books because of the sales and employee discounts! ), which was - and still is - a good description for me! The blue rail fence you see up top, as well as the brown shades one on my Flickr set, come from that book. Of course I got in to reading and posting on quilting newsgroups, lists, etc. around this time too, since I can't have any hobby or interest after c. 1991 that didn't involve looking it up on the internet (and eventually the WWW). I eventually joined the Austin Area Quilt Guild, although after a few years it got harder and harder for me to make it to the meetings so I eventually decided not to renew my membership. I did get a chance to work at one of their shows while I was a member, which was a blast. I have some photos from that show, but since it was back in the old film days, I'll have to scan them. You can see photos from the 2006 show here though. 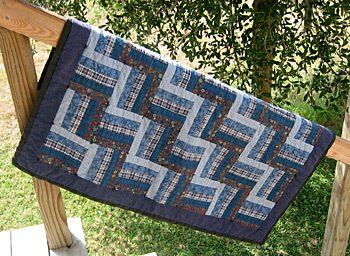 You can see all of the pictures of my projects that I've posted so far up on my Quilting Flickr set. And you can see photos from the 2006 AAQG show here.